With Kevin Sheedy and Duncan Ferguson’s u18 team riding high towards the top of the u18 Premier League we have a look at four young players starting to make a huge name for themselves. Ryan Ledson, Kieran Dowell, JonJoe Kenny and George Green have all impressed for the Blues this season and are regularly representing England. Ryan Ledson is considered by many to be one of the brightest young prospects in English football. The Liverpool born midfielder is expected to follow in the footsteps of previous Finch Farm graduates Jack Rodwell and Ross Barkley and progress all the way through to the full England team. Having only turned 16 in August, Ledson has already featured 6 times for the Alan Stubbs’ u21 team this season, starting three games and coming off the substitute’s bench on a further three occasions. Anyone who has witnessed Ryan in action will know he is a composed defensive midfield player, strong in the tackle and an excellent passer of the football. Ledson obvious leadership qualities have seen him appointed by England coach John Peacock as captain of the England u17 team, with three caps to his name and one goal. 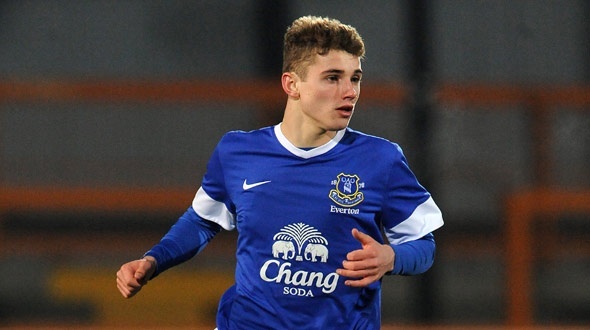 Prior to this season, he was a regular in the England u16 set-up, playing 7 times last season. The BBC Sport website published a recent article on English stars of the future and highlighted Ledson along with his England u17 and Everton teammate Kieran Dowell as two to keep an eye on. At Everton central midfielder Ryan Ledson, 16, and 15-year-old striker Kieran Dowell have already made their mark with England Under-17s. Their progress is being watched closely, with accompanying rave reviews. Another already making a huge impression is 15-year-old Kieran Dowell. Local boy, Dowell is primarily a midfield player and has played regularly a year above his age group for England and currently has 3 international caps at u17 level. A regular in and around the Everton u18 team, Dowell is yet to make his competitive debut for the u21 team although many are expecting him to get a taste of the action towards the end of the campaign. As he is still at school Everton are reluctant to release much information about his progress, but those who have seen him in action at Finch Farm or for England are excited by his immense potential. JonJoe Kenny has made huge strides this season and has progressed rapidly through the age groups to represent the u18s and on 7 occasions the u21s this season. Having turned 16 in March, Kenny remains inexperienced for a defender at that level, but as Kevin Sheedy described to the Liverpool Echo he is making up for his lack of stature with other qualities that will stand him in good stead for the future. “Jonjoe stepped up from the u16s and unlike some of the younger lads he has made the transition without hitting a wall. “He’s made really good progress and is a versatile player able to do a job for us in a variety of positions. “JonJoe is still growing so he’s not as tall as some of the players he’s facing but he’s got a great spring and doesn’t get beaten often in the air. George Green is a name a few more Blues will recognise, with David Moyes beating a host of Premier League clubs, including Tottenham and Liverpool to his signature. Green cost Everton £350,000 up front, and add-ons could bring the overall cost of the transfer up to the £2m mark. ‘This is one of the highest deals ever for a 15-year-old from a League Two club. After a difficult time, Green, now 17, is finally starting to fulfil some of that huge potential and has produced several match winning performances for Everton’s u18 team, including a hat-trick against West Brom. His fine form earned him a call up to the England u18 squad and he made his debut at that level in the recent international against Hungary. Green prefers to play in an attacking midfield role and has relished the freedom afforded to him by Sheedy and Ferguson this season. He has earned himself several call ups to the u21 squad and played in front of the 6,000 plus crowd that watched the Blues in action against Manchester United last week. Kevin Sheedy has described the positive developments in Green’s game to the Liverpool Echo. He said: “He is playing regularly and having an impact in games by scoring goals and showing his undoubted potential. “He’s also training well and has worked hard. We know he is a good player and now he’s performing at the level we expect of him and we hope that can now continue. Hopefully this is just the start and there is plenty more to come from him. “The England U-18 selection will give him a big boost. “We want to get him on the ball as much as possible in games and causing trouble for opposition defences. Which of the young players are you most excited about? Who is your tip to become the next player from the Academy to progress to the first team? Previous Post How would Everton fare in the Champions League?